The film will go on floor in September this year and the final preparations for the film are currently underway. Actor Suriya Sivakumar is currently shooting for his upcoming film with Selvaraghavan which is yet to be titled. The film is being produced by SR Prabhu under the banner Dream Warrior Pictures and will have Sai Pallavi and Rakul Preet playing the leading ladies. Expected to be released this year towards the end, this Suriya-Selvaraghavan combo is one of the most watched out for flicks in Kollywood this year. There were reports doing rounds that Suriya may team up with Irudhi Suttru director Sudha Kongara for a film, however nothing was officially confirmed. And now, according to latest reports, the film will go on floor in September this year and the final preparations for the film are currently underway. According to emerging reports, GV Prakash has been signed as the music composer for the film which is quite an interesting move by the makers since GV Prakash has been more focused on acting lately. “The rumours about the project have been doing the rounds for over a year. After months of discussions, the project has been finally locked. G.V Prakash Kumar has been roped in to compose music. The team is currently busy finalising the rest of the cast and crew. If everything goes as planned, the project should start rolling from September or November,” a source close to the makers was quoted as saying in a report by Firstpost. Actor Suriya did mention a while ago that he was in talks with the Irudhi Suttru director for a film and soon something may be finalised. 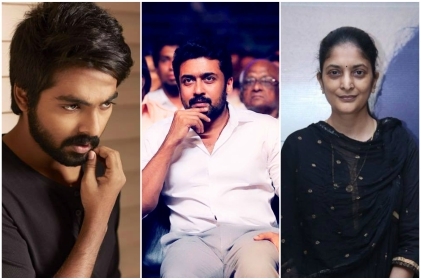 Besides these films with Selvaraghavan and Sudha Kongara, Suriya also has another film with KV Anand for which the script is underway currently. Reports are doing rounds that Bollywood megastar Amitabh Bachchan may play an important role in this film, however, an official confirmation is yet to be made.